In 2006, 105 firefighters lost their lives, to date 44 have perished in 2007. With all of the advances in firefighting technology, we consistently lose 100 firefighters every year. Firefighting is an inherently dangerous occupation and it is the responsibility of everyone on the fire ground to ensure that his or her brother or sister gets home to his or her family. The Beverly Fire Department, along with the rest of the Fire Service, will continue this Stand Down week with heavy hearts and facing the grim reality that we lost nine more members of our family this week. Our hearts and prayers go out to everyone affected by the terrible loss. 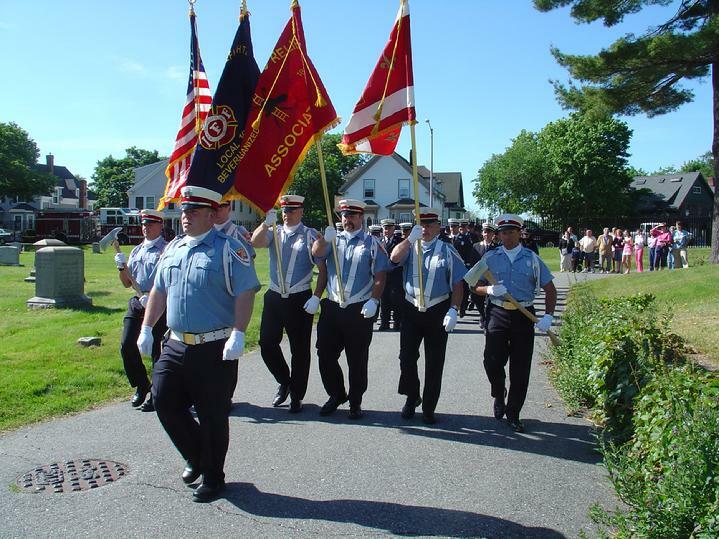 The Beverly Fire Department Honor Guard leads the way at a Firemen's Sunday Memorial. Beverly Firefighters remembered their fallen brother Beverly Firefighters, as well as every other fallen firefighter, in a ceremony held Sunday June 10 2007. The ceremony was held at the Beverly Firefighters Relief Memorial located in Central Cemetery on Hale St. The son of Roger P. Boardman is Daryl Boardman, a retired Deputy Chief with the Beverly Fire Department. William Reilly�s son, also named William, is a Lieutenant with the Beverly Fire Department. Robert Kelly missed seeing two of his sons join the ranks of the Beverly Fire Department. Robert B. Kelly's two sons served for the Beverly Fire Department. David Kelly, served 16 years as a Beverly firefighter before suffering a career ending injury while fighting a fire in 1999, while his younger brother Robert remains on the department. The daughter of Robert J McPherson, Mary Petrosino is an intermittent Fire Alarm Operator for the City of Beverly Fire Department. The disaster involved 2 vehicles and 8 passengers. As prom goers returned from the festivities, a car driven by an intoxicated operator crossed the median and struck a second car of prom goers resulting in serious injuries and two fatalities. Seniors watched as first responding officers assessed the scene and called for additional help. Then firefighters arrived and used the Jaws of Life to remove the roof of a vehicle to allow EMS workers to remove a trapped passenger. The most difficult portion was for students to watch their classmates bodies as they were removed from the cars and placed on the side of the scene covered with blankets. The bodies lie there until a sobriety test was performed on the operator and all of the victims were removed from the scene. 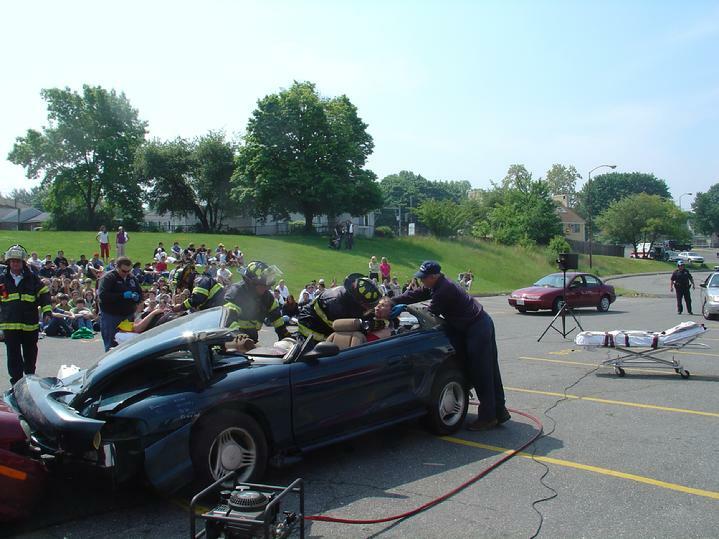 During the simulated action, statistics were read to the students as a reminder that alcohol and driving are a poor combination.